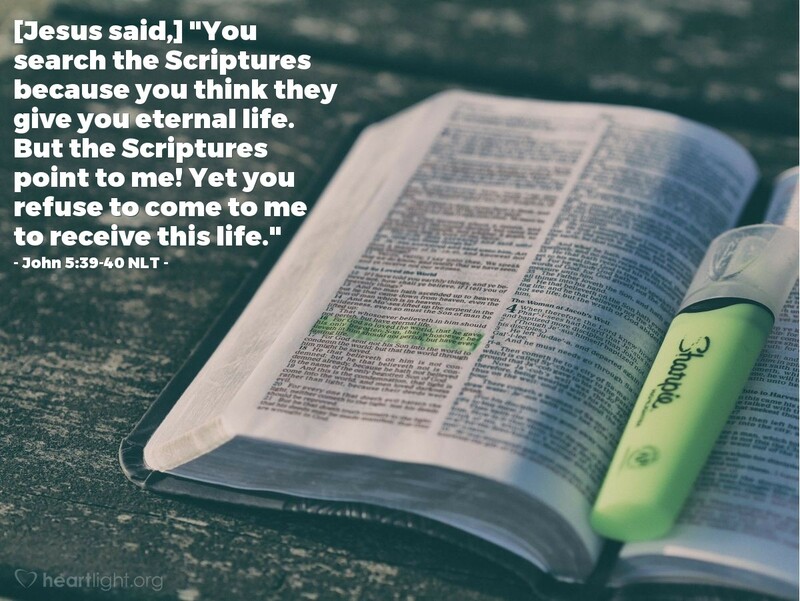 [Jesus said,] "You search the Scriptures because you think they give you eternal life. But the Scriptures point to me! Yet you refuse to come to me to receive this life." As important as the Scriptures are, Jesus is very much more important. He is the message to whom Scripture points. He is the key to unlock the message of God in the Bible. He is the reason the "Amen" can be spoken when Scripture is read. Jesus is the crucial, central, essential message around which Scripture turns. Why? Because he is God's greatest word (Hebrews 1:1-3). He is God with us, Immanuel (Matthew 1:23). He is God's message (John 1:1, 14). He gives life. Thank you, O LORD God of Israel, for speaking through nature, Scripture, and experience. Thank you, most of all, for speaking so clearly and definitively in Jesus. Please open my heart and my mind to the message you want me to hear. In Jesus' name. Amen.